It's time for Beate's weekend sketch! I don't make a lot of long rectangular cards, but the sketch was perfect for one, so I decided to use my largest long rectangle Nestabilities. There isn't a lot of stamping on this one, just the sentiment. I wanted the designer paper to be the main focus and kept everything pretty simple. The ribbon and flower are actually brown, though on my monitor they look black! 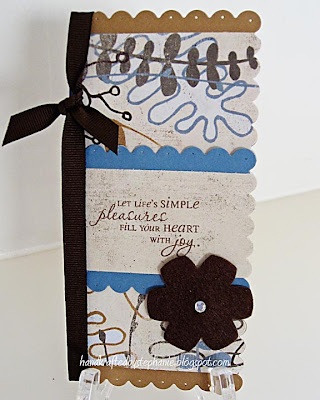 Cardstock: CTMH; Patterned Paper: Basic Grey Granola; Stamps: Verve; Ink: Memento Rich Cocoa; Nestabilities; Paper piercing tool; Other: ribbon, felt flower, rhinestone. Great card! I love the paper and that big felt flower.